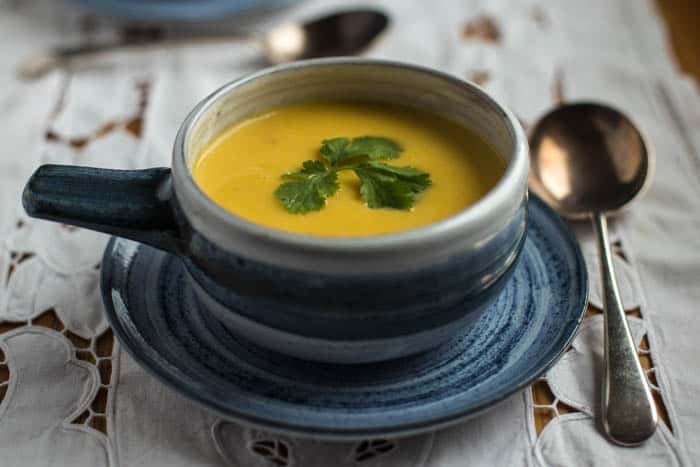 This Creamy Thai Butternut Squash Soup is rich and nourishing, yet packs a punch of fragrant Thai flavours. I need to be upfront about this, this soup started off life as a disaster. I’d planned to make a Thai curry using the first of our homegrown butternut squash but when I served it up, I was less than impressed. It kind of tasted like a spicy, lumpy porridge that was thick and gloopy and wholly unappetising. Rather than throw out this gigantic pan of gorgeous ingredients that had the misfortune to meet my creative side on a bad day, I chucked it all in the blender and added hot water from the kettle to make a soup. Happily balance was restored and I came out of this kitchen drama with my foodie status mostly unscathed. 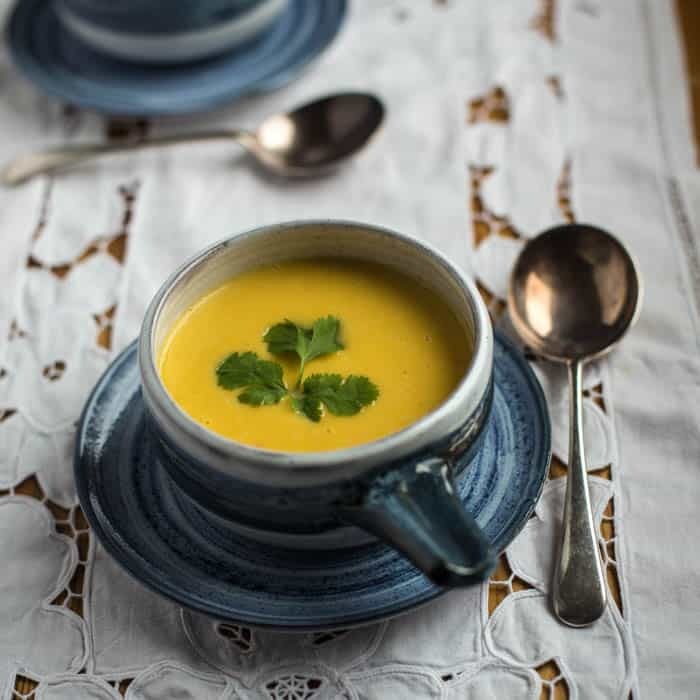 Servings: 6 -8 portions depending on size of squash and amount of water added to thin soup. In a large saucepan gently fry the onion in the oil until translucent. Do not let brown or burn. Add in the garlic, squash and stock/water and let simmer for 20 minutes or until the squash is soft and cooked through. Add in all the other ingredients, stir well and bring back to the simmer for 3 or 4 minutes. Be careful not to boil. 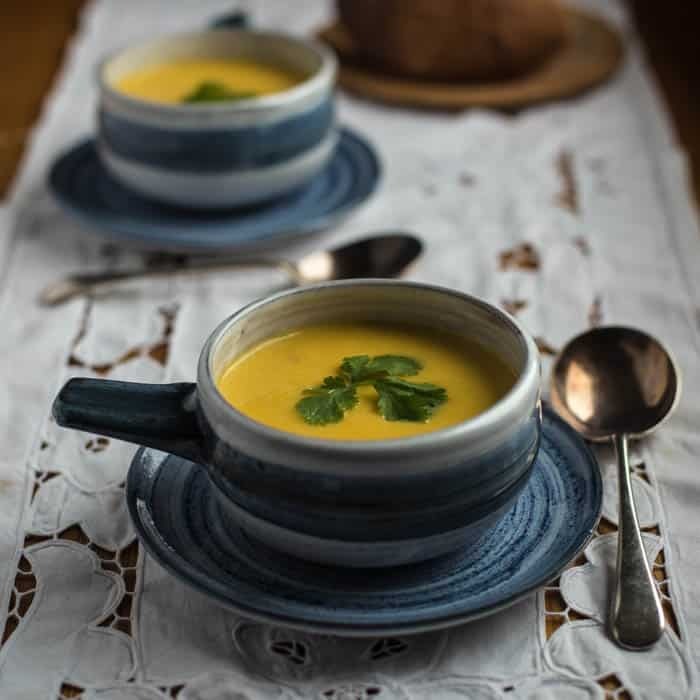 If using the block of coconut cream, be sure it has all melted into the soup. Pour into your blender and whizz together until smooth. Boil the kettle and top up with hot water until you have the consistency of soup that you prefer and serve. Oh how we love our kitchen appliances. This soup looks and sounds utterly scrummy. 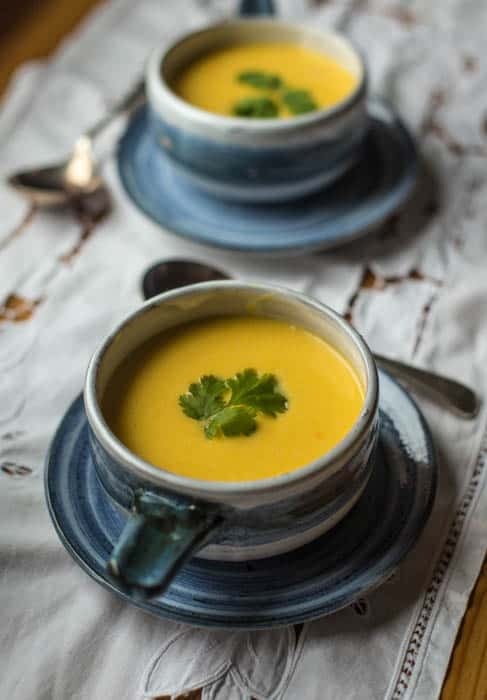 I’m sorry that your curry didn’t work out but very pleased you now have this delicious soup recipe. I cannot wait to try it! Sammie.